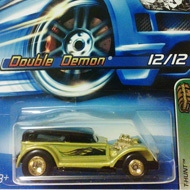 13/12 from the 2005 Treasure Hunt series. The black Drag Bus boasts blue, yellow, and orange flames with the Hot Wheels logo on the sides. It has the TH logo on the roof and “1995-2005” on the spoiler. The VW has black windows, Real Rider 5-spoke mag-style wheels with red line tires, and a chrome metal base. The VW debuted in the 1996 First Editions series. 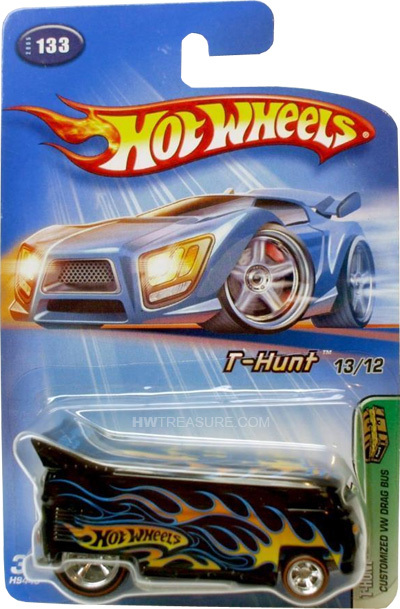 It was designed by Phil Riehlman and is more than 3 times the average weight of other Hot Wheels. The bus has been a fan favorite since its release.